On this anniversary of 9/11 I thought it would be worth listening to this message that fundamentalists of every religion need to hear. 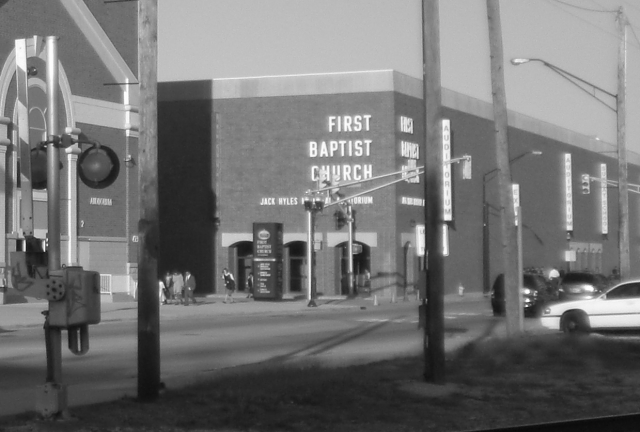 As part of the never ending quest for a broader definition of fundamentalism (including but not by any means exclusive of Independent Baptist fundamentalism) I’d like to contribute a few thoughts on what fundamentalism IS by taking a quick look at what it IS NOT. Fundamentalism is not just believing that the Bible is true; it’s believing that only one tiny group of people knows the “real truth” of the Bible. Fundamentalism isn’t having rules and standards; it’s having rulers who make themselves ultimate standard. Fundamentalism isn’t believing that your convictions are right; it’s believing that they could never be wrong. Fundamentalism isn’t applying our religious fervor to our political choices; it’s trusting political choices to bring about religious fervor. Fundamentalism isn’t a belief that people are sinners; it’s a belief that some few chosen spiritual elite are not. Fundamentalism isn’t striving for personal holiness; it’s wallowing in prideful ignorance. Fundamentalism isn’t loving hymns of the faith; it’s refusing to accept as part of the faith those who don’t love hymns. Fundamentalism isn’t teaching your children self-sacrifice; it’s happily sacrificing them on the altar of other people’s selfishness. Fundamentalism is not simply believing that God created the world; it’s living in an isolated world run by a god of your own creation. Someone is ruining Christianity. Someone is dooming America. Someone is sending souls straight to hell. We must find that person and call them insulting names in a sermon to the great amusement of the congregation. Including the angry at “someone” in the definition of fundamentalists also helps to show how stereotypical fundamentalist behavior is hardly exclusively found in Independent Baptist Fundamentalism. When non-Baptist pastors who are otherwise hip, cool, and trendy get in their pulpits or on their computers and begin to cross the line from contending for the faith into the world of sneeringly condescending to their fellows then the seeds of destruction are already sown in their bosom. It saddens me to see that so many fundamentalists become disillusioned with the graceless slings and arrows cast from IFB pulpits only to become the followers of other equally graceless men and movements. Fundamentalism dressed in skinny jeans and playing praise music is fundamentalism still the same. Being a fundy is never about a specific set of standards but is rather a misunderstanding of God and ourselves that results in a graceless attitude towards our fellow man. 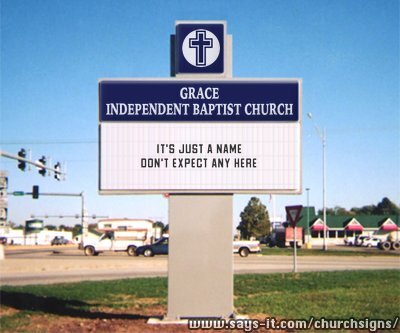 Some Baptists do it. Some Catholics do it. Some Republicans do it. Some Democrats do it — and on and on the list goes. Pick any issue near and dear to your heart and think of those with whom you disagree. If we cannot speak with grace and love to those on the other side of that issue then we should have a care. Perhaps it’s time for us to take stock and reevaluate our motives to see if we have become the mirror of the very thing we hate. We all have the potential to create our own new version of fundamentalism. On a personal level I spend a good deal of time in reflection trying to walk the fine line of attacking problems not people here on SFL while demonstrating absurdity, bad doctrine, hypocrisy, abuse, and plain old silliness. Sometimes pointing out those problems is best demonstrated by featuring a specific person but as much as I may be accused of hating fundamentalists, I try my best not to hate them or anybody else in this world. I would love nothing more than for for fundy pastors to humbled, fundy churches to be healed, and for fundamentalist universities to begin the work of helping instead of hurting. ‘Tis grace has brought me safe thus far. Perhaps grace will also lead us all home some day. Whenever another few days have passed and some fresh new scandal breaks in fundamentalism, someone inevitably expresses the hope that this time will the the Final Straw that breaks the back of institutional power. Perhaps this time the church will either mend its ways or be forced to close its doors. Maybe this horrific thing will cause the school to change its policies and soften its stance. Maybe. Perhaps. Hopefully. I confess that sometimes I’m hopeful too when some fresh new wave of truth crashes against the shaking foundations of fundyland. But my expectation is never that the entire system will collapse but rather that a few more will open their eyes. My constant hope is for a few remaining righteous to be vexed in their souls enough to to flee and leave those wretched churches and schools to slowly crumble. Empty pews not empty pulpits will signal the end of their era for there will always be hirelings looking for a flock. The great truth is that fundamentalism exists because people need it in the same way that a junkie needs his dealer. With as far to the fringe as fundyland has moved, most of the people who remain are simply not strong enough to survive outside of the walls that lock them in. They perversely crave judgment and delight when they have the chance to judge others. They rely on the rules and rulers to tell them what to think and say and do. Even their basic instinct to defend themselves and their families has been subverted to The Cause. They will stay no matter what happens. They will continue on no matter what evil is exposed in their midst. They must still be in the right. God must still be on their side. How could it be otherwise? The truth is too terrible to contemplate. There will be no fireworks to signal the end of fundamentalism. No banners will be raised nor conquering anthems sung. These churches and schools who have done such harm will meet their end in rust not flame. And as the final few sit surrounded by that decay the last of the fundamentalists will scream to the world that they are still winning even as their world crumbles around them. But be of good cheer. Though the time has not yet come to see the end of the IFB age, we do not despair. “Ichabod” is writ large above their doors and the blight is creeping in. God may perhaps grant some a measure of repentance leading to a knowledge of the truth. And we’ll be here to help bind up the wounds of those who escape. The end is not yet but the end is ever nearer.